My husband left a sweet little present on the counter for us. He knew that we have been pondering over what to use in our butterfly garden as tags to remind us what plants we are seeing. We had envisioned lovely Disney-esque signs in front of all our butterfly plants. The reality of this was proving to be rather expensive and time-consuming. We needed a lot. 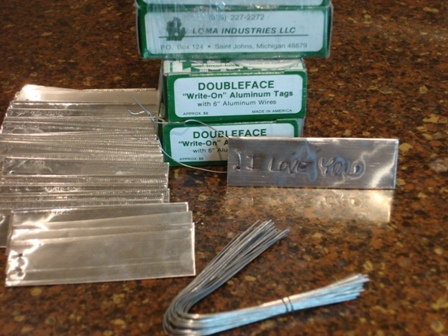 He found these double face “write-on” aluminum tags that come with 6″ aluminum wires. You just write on them with a ball point pen and they’re good forever. Both sides can be written upon. Our tags are small, but they can be ordered in several larger sizes. If you are interested in trying them too, I would recommend ordering from a company named USA BlueBook . You can buy a box of 100 aluminum tags for $17.78. We order from USA BlueBook frequently for industrial stuff. They ship fast and always include lollipops with the order. My kids love this company. We’re going to have a good time writing all of our plant descriptions on these tags. Grayson can’t wait. We’ll let three-year old Loring help too. Since we have plenty to work with, we’ll probably label everything in sight… until we run out of tags. 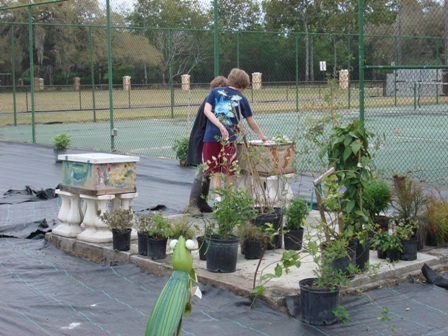 We’re working hard on finishing our butterfly garden. Even the neighbors are helping. I’ll post some pictures when it is planted, mulched, and tagged. Actually, we’ll continue to add to it. It will never be finished. 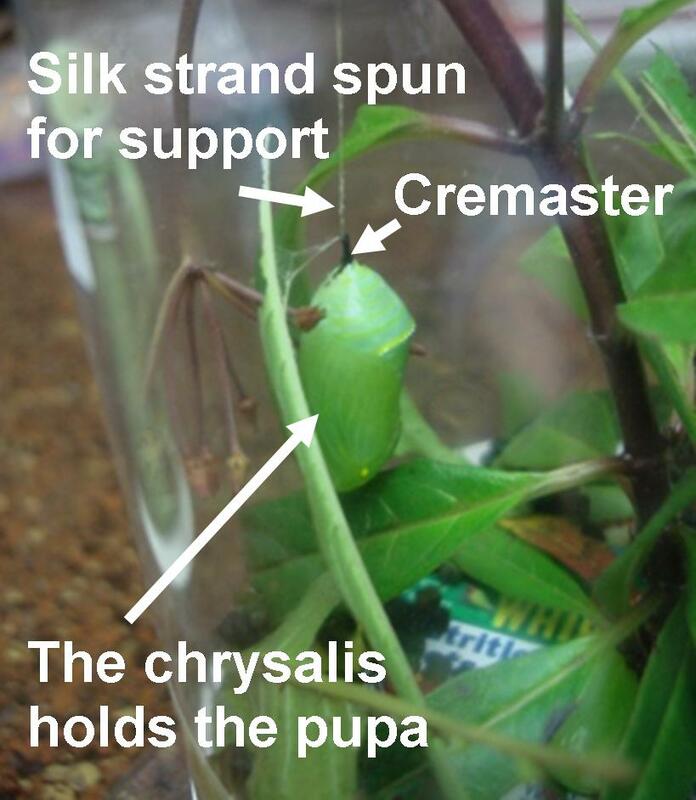 The caterpillars came out of their chyrsalides today in their butterfly habitat (soda bottle) that we made for them last week. 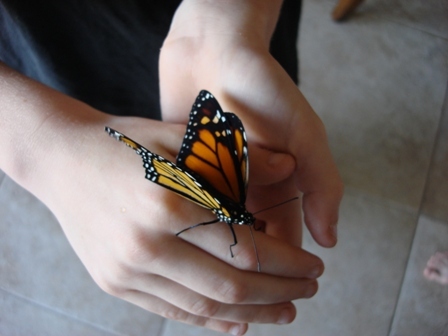 Beautiful monarch butterflies emerged. We watched them come out and we were so excited. It was a sight to behold! We took them outside and let them go on some scarlet milkweed (Asclepias curassavica) that we have growing right outside our windows. The butterflies flew around the garden all day and never left. They jumped from flower to flower. Loring refers to them as mariposa’s (spanish for butterfly). Monarch flying around its new home. Butterflies are territorial and each species will have their own host and nectar plant that is necessary for survival. The host plant is where they find a mate and lay their eggs as caterpillars. 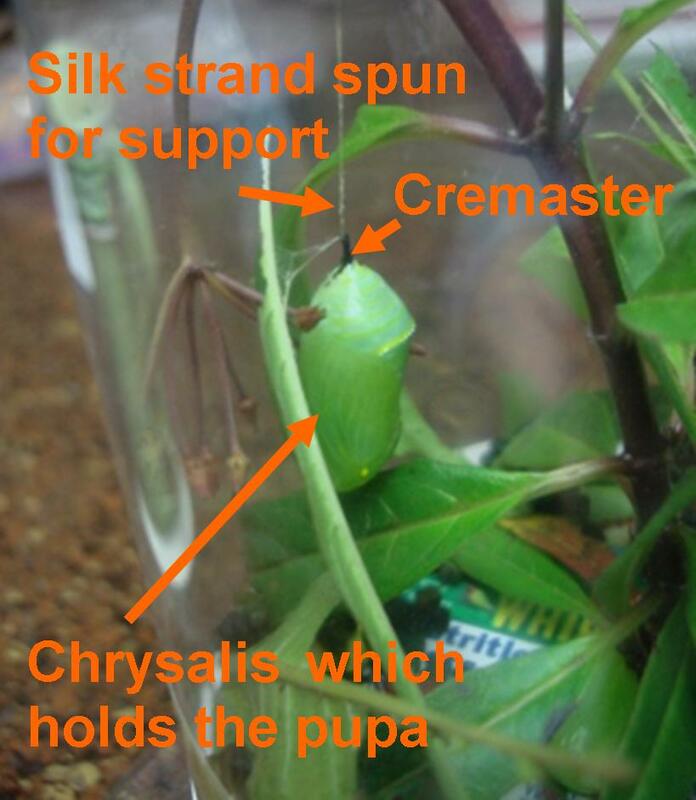 The nectar plant is where they fuel up on nectar after they have completed metamorphosis and have become a butterfly. They can fly great distances. 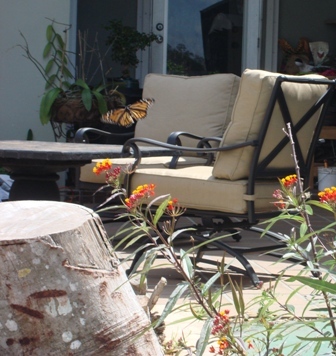 The monarch is a year-round resident in south Florida, but is migratory in the rest of the continent. The monarch in the picture above stayed around all day. The scarlet milkweed (pictured above) serves as both the host and nectar plant for the monarch butterfly. 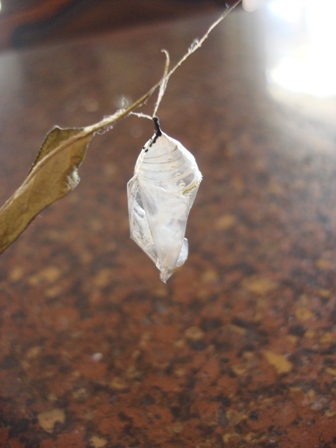 There is a good chance this one will complete its life cycle in our garden. We have scarlet milkweed growing all over our yard. The University of Florida has a website that lists the regions of Florida and which butterflies and plants are best for each region. 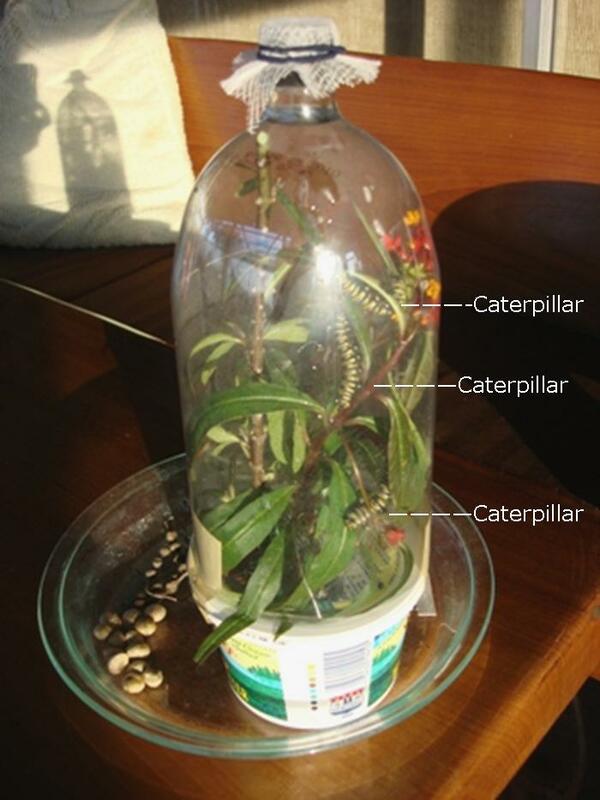 Butterflies visit cities too and would be attracted to a butterfly garden in containers. There are so many interesting plants growing in our yard and many of them need attention, but we’re really grooving on our butterflies. We did plant some really awesome and unusual fruit and vegetable seeds today though. We can’t wait to tell you what we’re planting now. If you plant it…they will come. 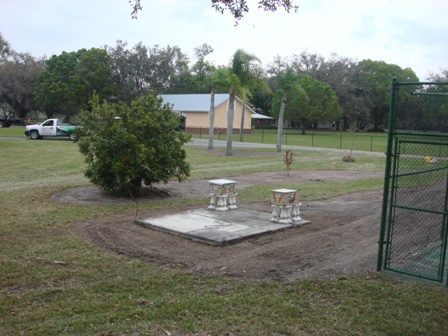 Both areas of dirt is where the butterfly garden will be planted! This is a project that got out of control…quickly. Grayson and I planned for a butterfly garden around our bee boxes. It started as a small garden to attract the flying critters we love and turned into a monster project. We have been collecting lots of butterfly, bee and hummingbird plants and decided we need a lot more space. We picked up some monarch caterpillars over the weekend at a burrowing owl festival. We made a habitat for them out of a plastic soda bottle and an empty butter container. We filled the butter container with water and poked a hole in the middle of the cap to insert a scarlet milkweed cutting. We cut the plastic bottle along the bottom edge and used some tape to attach the two containers together. I covered the top with some cheesecloth and a rubber band. 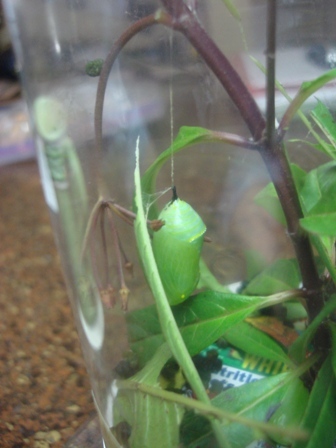 One of the caterpillars turned into a chrysalis almost immediately after moving into his new home. We watched in amazement…caterpillar t.v.